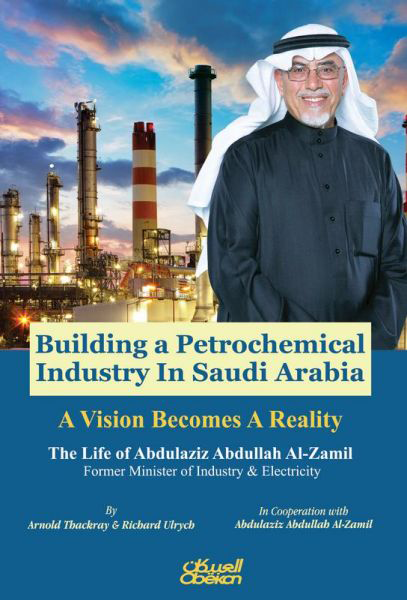 This book exemplifies a common genre: the celebratory account of the life and career of a capable and successful individual — in this instance Abdulaziz Al-Zamil — who has occupied important positions in both the public and private sectors. What makes this account much less common is that the country in question is the Kingdom of Saudi Arabia. As one might expect, this is not a book in which the reader will encounter criticisms of individuals nor critiques of government policy. Nor is the reader provided with anything like a comprehensive analysis of the difficulties, disputes and dilemmas that confronted the kingdom's development of the petrochemical sector. This is to be expected; a positive air of achievement prevails. What problems do arise are discussed from the standpoint of obstacles that can and will be overcome. There can be little doubt that our protagonist hopes that his own experiences will prove inspirational to young Saudi Arabs, and that they, like him, will aspire to advance the interests of their homeland (one assumes an Arabic version is available or in preparation). Despite the foregoing, however, one would be wrong to dismiss this account as an anodyne exercise of limited value to the outside observer keen to understand the kingdom's industrial development. What justifies our attention, in part, is that Abdulaziz Al-Zamil was an important member of the group of Saudi Arab technocrats who came of age as the state sought to "extend the value chain" in the exploitation of hydrocarbons. His trajectory — from a young researcher at the Saudi Consulting House (a joint effort of the government and the United Nations) to the Saudi Arab Basic Industries Corporation (SABIC) and, ultimately, to the position of minister of industry and electricity — is representative of the way talented and trusted Saudis were harnessed by the state through educational and employment opportunities to fulfill national ambitions. And, despite retirement from government service, Mr. Al-Zamil remains an important player for the fulfillment of government economic policy initiatives, specifically the expansion of the private sector, through the business activities of the family firm, Al Zamil Group. As the narrative makes clear, Mr. Al-Zamil's own capabilities and commitments were aided by fortuitous timing. This extends beyond the personal. His career in the public sector unfolded during a period characterized by a state increasingly adept at implementing industrialization and replete with the substantial rise in oil revenues that permitted the necessary expenditures. He was also fortunate in the friendship he forged with one of the most fascinating of all prominent Saudi government officials, Ghazi Al-Gosaibi, while both were students at the University of Southern California. What amplifies interest is that the work is structured to provide extensive direct quotations from Mr. Al-Zamil. His views and recollections, though without doubt carefully calibrated, not only add a human dimension to the process of development but invite consideration of what he chooses to address and how he does so. Of note is his reference to the inadequacies of PETROMIN; a rare moment of censure in the book and a perspective he shares with another exceptional Saudi technocrat, Ali Al-Naimi, as expressed in the latter's recent autobiography (Out of the Desert, 2016.) It is also of interest to hear the extent to which King Fahd was personally attentive to the effort to electrify remote areas of the kingdom, an illustration of how the creation and functioning of basic infrastructure was linked to the political order's legitimacy. In addition, Mr. Al-Zamil alludes to issues that continue to complicate the government's ongoing efforts to foster economic development. The investment and operational costs of state-provided utility services are not recouped through charges to the end-user — a matter that distorts use and investment while challenging fiscal sustainability — and a government regulatory structure too often impedes investment. Finally, Mr. Al-Zamil, in his discussion of the control over a fund he created while minister of industry and electricity to introduce a small surcharge on electricity use, hints at the interministerial budgetary struggles that can characterize state-funded development in the face of fiscal volatility. While these issues are not explored in depth, Mr. Al-Zamil draws our attention to them, and this, in turn, ensures the book serves as a useful primer on key aspects of development. Mr. Al-Zamil's experiences remind us that qualitative factors are just as critical as the quantitative to the kingdom's efforts to direct and achieve developmental aspirations. It is worth highlighting that his educational endeavors were international in scope. This provided him with a nuanced understanding of other countries, a vital form of knowledge for the kingdom's economy with its deep global connections. In addition, the book conveys a sense that industrialization is very much an "all or nothing" process, given the critical interdependencies. With all the complexities, effective administration is as irreplaceable as technological expertise. Mr. Al-Zamil's career took place during a time of massive state-directed and -financed industrial development. The Saudi government is attempting to move away from such an approach, driven in part by the imperative of achieving fiscal balance. One indicator of this shift is of immediate relevance to the Saudi petrochemical industry: the recent decision to transfer the government's stake in SABIC to Saudi Aramco, with the proceeds to be deposited in the Public Investment Fund (PIF.) Under Mr. Al-Zamil's leadership, SABIC emerged as a commercially successful enterprise with a distinct identity that is now engaged with expanding operations and positioning itself internationally. One can but wonder what Mr. Al-Zamil thinks of this strategy. Having been introduced to him through this book, one would like to continue the conversation.